Libraries are suffering at the hands of budget, curriculum and digital demands. But we must not underestimate this vital resource. I remember my school library: it had two floors with spiral staircases, individual study cubicles and a classroom on the upper floor. It was attached to the sixth form block, giving the students easy access to a study facility. One particular memory is of a Puffin Books sale – I could even tell you the books I bought (and still have). This was in the days before personal computing so the only source of information – apart from other people, TV or radio – was books. There was something tactile about walking up to a shelf, looking along the spines and selecting a book which you hoped would answer the question posed in your homework or choosing a work of fiction by reading the blurb on the back. In recent years the picture has changed; the proliferation of personal electronic devices means information is instantly available almost anywhere and the printed word is in decline. Libraries as we knew them are changing: public libraries now provide access to the internet in addition to their DVD lending sections; many school libraries have also followed the electronic route and have been re-named “learning resource centres”. This is not just a name change. This new title has changed the focus of school libraries too. Books are no longer de rigueur; some senior leadership teams seem to feel their students are no longer interested in real books and are replacing them with electronic equivalents. Some teachers are reporting that their school libraries are closing and the remaining books, after many have been thrown away, are being transferred to classrooms or corridors, where there is no space for quiet study or reading. A survey by the Association of Teachers and Lecturers (ATL) suggests teachers are concerned about the future of school libraries. Almost all of the 485 school staff who responded to the survey said their school still had a library. 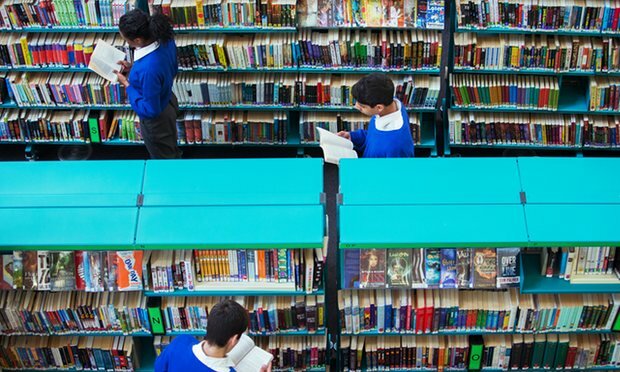 But 22% said their library had suffered at least a 40% cut in funding since 2010 and 21% said their budget is insufficient to encourage pupils to read for pleasure. This is not helping pupils’ literacy skills: removing the very objects which children need to access regularly will lead to even less opportunity for them to engage with non-fiction and fiction, which fires the imagination far more than the pre-constructed world in a computer game. It’s not just books that are lost, either. Many schools are making librarians redundant (to try and balance their books). Almost a fifth (19%) of respondents to the ATL survey said the library staff hours had been cut and 11% said library staff had been made redundant. But a library is more than the sum of its books; it is a hive of knowledge and a place where the research skills necessary for future study are honed. Librarians do more than stamp books – they are a source of advice and information, and are central to developing children’s love of reading. They often hold reading clubs and sometimes put on activities to support special events, such World Book Day. This is the loss of a vital team member. So what would an ideal library look like? We are in the digital age and this needs to be reflected in school libraries, but it should not be to the detriment of the printed word. I see a library as a place of learning and research where the printed word works alongside digital access. There should be a choice for learners – not all young people want to use computers and some prefer to curl up with a real, tangible object rather than a virtual equivalent. Computers or e-readers could form an essential component of a school library but should not replace the printed word. Digital skills are also important and pupils without computer access at home need to get that somewhere – but not at the expense of developing research skills around older, non-digitised media. A balance between the two is needed in a well stocked and planned library. The important factor that links the digital and printed forms is the person who oversees the library. A librarian provides the knowledge and skills to point learners in the right direction. A library without a librarian is like a school without a headteacher – there is no one to lead and develop the resource. We must ensure pupils are able to access school libraries that are properly stocked and have a librarian overseeing their development and use. Schools should be required by law to provide a properly located and stocked library, overseen by a librarian, with adequate funding to ensure this can occur. All new schools should be planned with a dedicated library space and all current schools would need to be helped to provide the space necessary. Libraries should be a right in schools. We must give pupils the opportunity to go to a quiet place to do extra study or to choose a book to read. It is particularly important to children from deprived areas. Opening a library door helps children open their mind. For many, books are too expensive and a library allows students to borrow them. Libraries need to be suitable and accessible to all children – not made redundant on the whim of those who mistakenly think they are outdated and irrelevant.